Food and agribusiness is one of the fastest changing global markets; change that is driven by technology, developments in manufacturing and supply, and a growing consumer engagement. The success of the agri-food industry and many of our household brand names will depend on how much you understand about these changes and the extent to which you can deliver secure and competitive products in the face of growing expectations about food safety and quality, as well as changing attitudes about the environment, human diet and nutrition, and animal welfare. 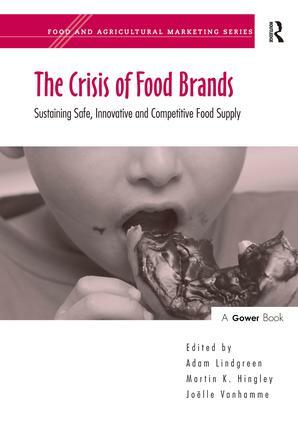 The Crisis of Food Brands offers perspectives on many key aspects of these changes including the role of business, policy-makers, and the media in communicating with and engaging stakeholders about: o relevant and dynamic models of risk and crisis management; o the value of innovative and, sometimes controversial, food systems; o their buying behaviour and attitudes to movements such as organic and fair trade; o how and where we source and buy our food now (and in the future). The quality of the original research that underpins this book and the imagination and practicality with which the authors address its applications for the industry is first rate. Anyone with responsibility for marketing food, communicating about the food industry, or engaging with consumers will find this an important source of ideas and inspiration. Contents: Foreword; Part 1 Food Crisis and Responsibility: The Dasani controversy: a case study of how the launch of a new brand jeopardised the entire reputation of Coca-Cola, Conor Carroll; Cadbury's salmonella scare: good or bad crisis management?, Conor Carroll; Risk communication and food recalls, Sylvain Charlebois and Lisa Watson; Food safety, quality, and ethics in supply chains: a case study of informing in international fish distribution, Per Engelseth, Takeo Takeno and Kristian Alm; Is fresh milk powdered milk? The controversy over packaged milk in Vietnam, Virginie Diaz Pedregal and Nguyen Ngoc Luan. Part 2 Agri-Food Systems, Product Innovation, and Assurance: Quality assurance schemes and food marketing in the European Union, Stephan Hubertus Gay, Fatma Handan Giray, Pénélope Vlandas and Monique Libeau-Dulos; Organic versus conventional farming: a marketing survey on wine production, Frederica Cisilino and Luca Cesaro; Critical aspects of consumption of genetically modified foods in Italy, Marco Platania and Donatella Privitera; Solving the controversy between functional and natural food: is agrifood production becoming modular? Roberto Esposti; Controversies in managing competencies: the case of development and launching new functional food products, Jofi Puspa, Tim Voigt and Ranier KÃ¼hl; Is there a real health versus taste or price controversy in food marketing? The case of functional foods, Athanasios Krystallis, Michael Linardarkis and Spyridion Mamalis. Part 3 The Consumer View: Controversies in food and agricultural marketing: the consumer's view, Keith Walley, Paul Custance and Stephen Parsons; Consumer preferences for food quality: a choice experiment regarding animal welfare and food safety in chicken, Morten Raun MÃ¸rkbak, Tove Christensen and Berit Hasler; Consumer demand for ethically improved animal production systems, Ana Isabel Costa and John Cone; Beyond the marketing mix: modern food marketing and the future of organic food consumption, Hans Dagevos; Green consumerism: what can we learn from environmental valuation surveys?, Meike Henseleit. Part 4 Fair Engagement? : The elusive written contract: dependence, power, conflict, and opportunism within the Australian food industry, Melina Parker and John Byrom; Are supermarkets poor-friendly? Debates and evidence from Vietnam, Paule Moustier, Muriel Figuié, Dao The Anh and Nguyen Thi Tan Loc; An appraisal of the fair trade system: evidence from small producers in emerging countries, Luciana Marques Vieira and LuÃ­s Kluwe Aguiar; Index. Dr Adam Lindgreen is professor of marketing at Cardiff University. Previously he was professor of strategic marketing at Hull University Business School, U.K. After graduating in engineering, chemistry, and physics, Dr. Lindgreen first finished an MSc in food science and technology at the Technical University of Denmark and is now a European Engineer (EurIng); he then finished an MBA at Leicester University. In 2000, he received his Ph.D. at Cranfield University. He has published widely, and his awards include Industrial Marketing Management's Outstanding Article 2005. His research interests include business and industrial marketing management, consumer behaviour, experiential marketing, and corporate social responsibility. Dr Martin K. Hingley is professor of strategic marketing at Lincoln University. Previously he was a Reader in marketing and supply chain management at Harper Adams University College, the leading UK university specializing in agri-food business. He is a visiting fellow to the University of Hull Business School and held a fellowship endowed by Tesco Plc. He graduated in agricultural and food marketing from the University of Newcastle upon Tyne; has an MPhil in marketing from Cranfield University; and a PhD in marketing from the Open University. Dr Hingley also has wide business experience in the international food industry and has spent time in provision of market and business analysis with the Institute of Grocery Distribution. He has presented and published widely in applied food industry marketing and supply chain relationship management. He serves on the board of several scientific journals. Dr JoÃ«lle Vanhamme is associate professor at the IESEG School of Management, Catholic University of Lille. She has a degree in business administration and two master degrees from the Catholic University of Louvain. She has been awarded the CEMS master degree from the Community of European Management Schools. Dr. Vanhamme received her Ph.D. from the Catholic University of Louvain and is currently visiting professor with Hull University Business School. Her research has appeared in several journals. The food and agricultural industries are experiencing changes that, in many ways, are as profound as those of the industrial revolution in 19th century continental Europe. There are commercial challenges related to the globalisation of food production, food technology, retailing and distribution; social and environmental challenges related to growth in world population and changes in our planet's climate; and there are changing attitudes amongst consumers towards factory farming, food safety, movements such as organics or free trade, and an increased level of activism enabled by new communication technologies. The Food and Agricultural Marketing Series aims to explore these issues in a rigorous and yet very applied manner and from the perspective of food and agribusiness communicators; brand managers, policy makers, or members of the media reporting. The series brings together the best original research from around the world and offers commentary and practical advice on its implications and applications. The objective is to provide readers with the understanding of the opportunities and risks associated with the industry and the confidence to communicate with and engage consumers and others in the food supply chain in an authoritative, ethical and effective way.